Samantha Cowen & Josee Charbonneau have returned home safe. It’s NOT all that are found but out of the 2 new missing, 2 have been found! Such a great email to wake up to! It’s bitter sweet however because it reminds us that we are still 2 out of 4 total missing teen girls in the last 5 months…brings deep sadness thinking of why can 2 return and not the others. *Just a friendly reminder* I am NOT an officer, reporter, or anyone special in regards to writing these posts or in finding these girls. I am a single Mom with children and I put myself in the shoes of these hopeful parents and just trying to HELP in anyway I can; in Talking About #OurMissingYouth …ONLY because, if I were in their shoes, I’d hope the public would CONTINUOUSLY Tweet, Share, Hashtag, Post, Search, Look, Listen, Whatever; to assist!!! Feel Free to Leave a Comment below with a PRAYER words of HOPE, KINDNESS, or STRENGTH for the parents of these girls and I will insure its delivery to the parents, as we have met #findMilaJohnson in years past. Firstly, I’m just a supportive Mom that heard my nieces friend was missing. I HAVE met, in a few short visits, Mila Johnson. In much experiencs with youth, I found Mila gentle, sweet, quiet, funny, as I watched her interact with my own children and family. I have no connections to the Police or their investigations, I do not endorse or oppose any ideas for finding Mila–I am simply, sharing and spreading the word. Feel free to leave a supportive comment, prayer or share this with your Followers, reblog or the like. My hope and purpose is to get people talking and listening. Listening to passerbys talking in the streets for MILA’s name, to encourage OurYouth with Valueable Information to call Peel Police at 222-TIPS to HELP. More of us should mention Mila’s story on radio, tv, paper, everywhere–so Mila herself or perpetrators clearly understand: BRING MILA HOME! The cold weather is FAST approaching, days are getting darker, colder, and longer–WE MUST act fast! I believe as a collective public, we have some form of responsibility in assisting to find today’s missing youth. The WORLD has changed. Completely. PLEASE HELP. 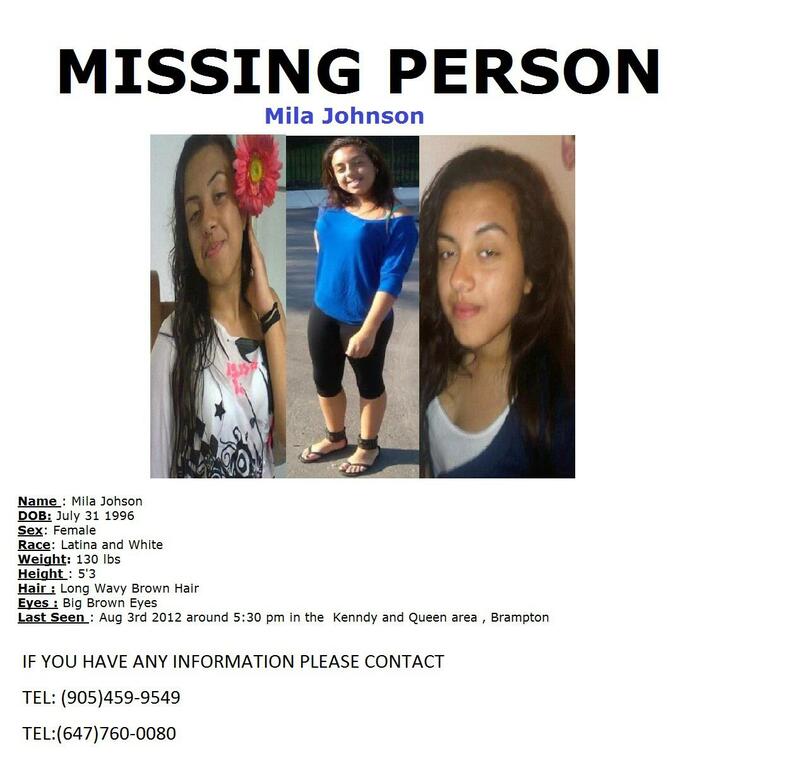 Keep tweeting and RT #findMilaJohnson today. In closing and without a doubt, we send our empathetic support, prayers, to every Other Family with any type of missing loved one as well. Thank you for your time! KONY 2012 — with an Open Mind ! It was a brief reminder that your efforts around the globe LITERALLY, ARE CREATING CHANGE!! LOOK, even I HAVE my somewhat DOUBTS about KONY 2012 BUT, here’s what sets ME apart from the mass that completely DON’T believe, & spend their time posting & talking only about allll the untruths & negativity surrounding the creator(s), the movements efforts, origin, or what they THINK they know about what’s going on LRA regions of the World. (Truth is, none of US are really there!!! HERE’S THE THING: even if there’s no arrest at the end of world wide phenomenon, WHO are THE CRITICS TO DECIDE THAT BEFORE we complete our trial at capturing KONY? Who’s TIME R WE REEALLY WASTING, letting the World know that this stuff is going on?? I will post the video when i figure out & how OR, google it yourself! Just Maybe, it’ll give YOU, something else to critically tear apart to shreds! OR–you could LOOK ON THE FACES of the Supporter Cities they show in this video…. SERIOUSLY…pause & really look at their faces–ALOT of TEENS!!!! Look at them, they are our future! If THEY WANT To feel like THEY, “BELONG TO SOMETHING” THIS ENORMOUS, & even if they just end up getting a FEEL for “BEING PART of SOMETHING GREATER”, or a “WHOLE”, or sense of “PURPOSE”, or attention, or self recognition, maybe this is the first time some have been in front of a camera, gain some flicker of self esteem; what if they make some sort of “SENSE” out of THEIR LIVES, & control of THEIR FUTURES (cuz the future IS THEIRS) …then WHO ARE U CRITICS TO TAKE THAT AWAY FROM THEM????…. MAYBE, u critics should b looking at this GLOBAL MOVEMENT selfLESSly, instead of with SELFCENTERED tunnel vision, n LET the children of the future MAKE THEIR mark in THIS WAY! Let THEM make a difference! Let them belong! Who are you Really, that you should spend your greatest efforts to try to “take the rug out from under their feet”–POWER TO THE PEOPLE LOL!!! United we stand divided we fall or fail, it’s YOUR choice! believers believe, non supporters move on…thanks for reading!